The Mego Corporation was best known for its grasp on the future of toys in the seventies. With their advent of the 8" doll, many great creations were close to becoming reality. 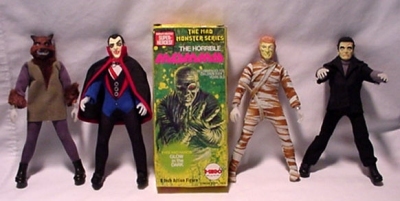 A specific favorite amongst many toy collectors are the Mad Monster series. This simple set of four dolls are some of the greatest achievements made by the acclaimed company. The Dreadful Dracula, The Human Wolfman, The Horrible Mummy and The Monster Frankenstein. All four had groovy glow-in-the-dark hands and eyes. One playset was developed for the line and is extremely difficult to obtain: The Mad Monster Castle. As for the four figures, no single monster is more rare than the others, although a few variations exsist. Three noted variants are: Dracula with smoothe black hair, Dracula with smooth bright red hair, and the hardest of them all the Frankenstein with blue hair instead of the staple black. The packaging from Mego was also very diverse for the series. The figures have been found in solid boxes (the most common), carded, and with window boxes (very rare). The prices for loose specimens are generally between $50 to $100 on a good day in the secondary market, but, some window box pieces can sell for as much as $500 plus. Mego's Mad Monsters are evil, sinister and perfect additions to the any monster collection.